For us, the uniqueness of the Windesheim heritage lies in the fact that, from the 16th century, it was passed on to successive generations of young exiles, many of whom were closely connected with the English Martyrs. These generous souls, who were accustomed to adversity, unconsciously tempered the spirituality they first assimilated at Louvain, and then at Bruges, with a certain robustness that we see throughout our long history. On the evening of the feast of the Exaltation of the Holy Cross, five English nuns disembarked from a barge at the “Minnewater” at Brydges (Bruges). Where were they from and what were they seeking? 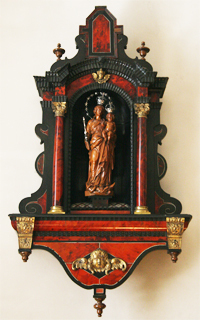 They had come from Saint Monica’s in Louvain, an entirely English convent founded in 1609 by the old Windesheim priory of Saint Ursula (1415), situated in the same town. Some of the Brothers soon aspired to a life devoted more exclusively to prayer; indeed Master Gerard himself had always felt a desire to withdraw from the world. He already had some experience of the religious life; after his conversion in 1374 he had withdrawn for a period to Monnikhuizen, where he had come under the influence of the Carthusian monks, and had been deeply sustained and moved by the Holy Scripture and the Fathers. But he was also familiar with the life of the Canons Regular of Groenendael, in the Soignes forest, after visiting their Prior Jean Ruusbroec (1293-1381), the great Brabant mystic, who had also greatly influenced him. The events of the French Revolution and the Franco-Austrian war resulted in a stream of priests and nuns arriving at Nazareth, where they found temporary help. But, on 1 May 1794, the advance of French troops made flight inevitable and a temporary refuge was found at Sluys. A return to Bruges was possible five weeks later, but the following June the sisters again had to leave immediately. All able-bodied members of the Community, accompanied by their Almoner, Father Andrew Oliver, and under the care of their Prioress, rowded into carts that were to take them to Antwerp. 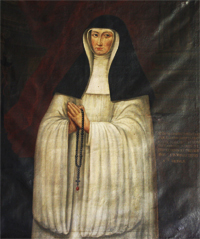 Only Sister Olivia Darell and a few sisters remained at the Priory. The Chronicle describe the fugitives’ fortitude. “In these terrible circumstances, everyone tried to remain calm and serene”. When it was confirmed that the rench had entered Bruges, Mother More decided to go to Rotterdam and from there on to England. Les péripéties de la Révolution Française et de la guerre franco-autrichienne provoquent un défilé de prêtres et de religieuses à Nazareth qui y trouvent un soulagement momentané. Le 1er mai 1794 il faut fuir devant les troupes françaises. Un asile de fortune est écouvert à Sluys. Cinq semaines plus tard, le retour à Bruges devient possible, mais dès le mois de juin suivant, le départ immédiat s’impose. Tous les membres valides de la communauté se groupent dans des charrettes à destination d’Anvers sous la conduite de leur prieure. Sister Olivia Darell reste au monastère avec quelques sœurs. L’entrée des Français à Bruges étant confirmée, Mother More décide de se diriger vers Rotterdam et de là en Angleterre. On 17 October 1387, six Brothers of the Common Life, who had trained for the canonical life at the Eemstein monastery founded by Groenendael in the Netherlands, made their profession as Canons Regular at Windesheim, the “Windy House”, or “the Vine of Eternal God” in the monastery church that they had built with their own hands; the Congregation of Windesheim was born. Jean Busch, in his Chronicle, vividly evokes the spirit of these men who had voluntarily withdrawn from the world to follow Christ in a life of prayer, simplicity and humility: “Not through constraint but in the freedom of love”. In order to be less exposed to noise, as the current chapel is situated right at the centre of all the noises in the house. Because our voices are not strong, and the vaulted roof of a church would greatly help our singing. So that our boarders will no longer have to go through the Monastery to get to the church. Because we need more parlours … and also somewhere to store our grain, for which the old church could serve. The earliest Devout and Windesheim authors, such as Gerard Zerbolt de Zutphen (1367-1398), Jan Vos van Heusden (1363-1424), Gerlach Peters (1378-1411) and Jean Mombaer (1460-1501) perpetuated the Modern Devotion message. But the essence of the message is given to us by our brother Thomas à Kempis (1379-1471), in his four small treatises, collected into one work called the “The Imitation of Jesus Christ”. This work bears witness to Thomas à Kempis’ long spiritual training and to the effects of the century-old tradition that started with the Fathers of the Desert and Saint Augustine, continuing through to Saint Bernard of Clairvaux, Saint Francis, Saint Bonaventure and the Dutch and Rhineland mystics. Our Congregation itself has always been international in character. There are communities in Holland, Belgium, England, Rwanda, France and Tanzania. Since 2001, the English Convent has a special link with the Monastery of Our Lady of Peace, Rwamagana (Rwanda) where two Rwandan sisters and one from Burundi went as founding members. Further afield, Sister Mary Niu, a Chinese sister who had her formation in our Community in England, returned to China in 2008 with the hope of starting an Augustinian contemplative community there: The buildings are already well advanced. 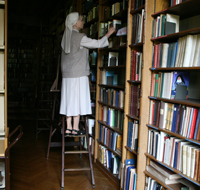 Around Sr Mary there are one novice formed in England and two chinese postulants. Thus linked to our roots and part of a living tradition we hope to continue by our prayer and our whole way of life to respond to the needs of the Church and the world of today. The English Convent will open its doors on 20th February 2020 for this new venture. The 17th and 18th century buildings will be shown to organised groups three times a day, four days a week. 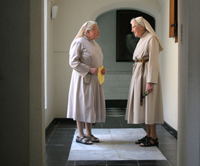 The Project envisages showing certain parts of the monastery with the possibility of meeting some of the sisters who live there and lead a life of work and prayer. The idea is to show a form of life that is little known. Toerisme Vlanderen support this project financially.